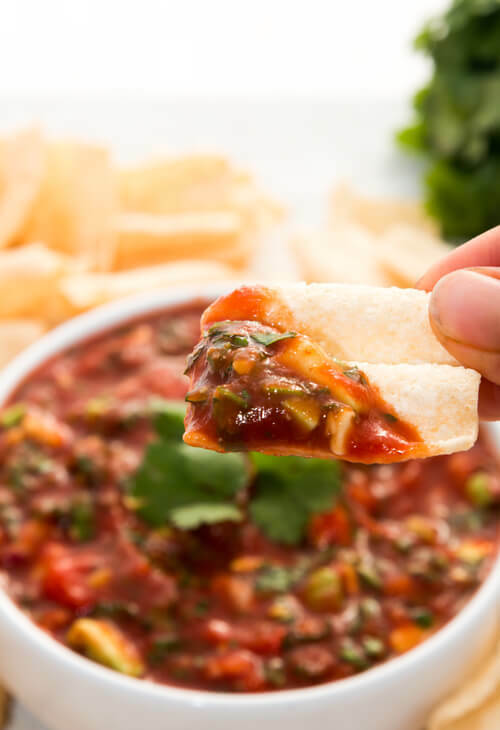 My favorite dip for any kinds of chips is a salsa dip. This time around, my quinoa chips needed a homemade salsa to dip into and that was when this Easy Avocado Salsa Dip was created! This salsa will take you just a couple minutes to whip up. It's low-calorie and made with vegetables and fruit. This easy salsa supplies your body with vitamin E (from the tomatoes), dietary fiber (jalapeno nutrient), vitamin C (packed in avocado), and manganese (in the garlic). As you see, its packed with so many nutrients! Salsa not only makes a great treat to any party, but also a healthy snack. I am really not a football fan, but with all the craziness about the Superbowl, I might just watch the game this Sunday. Do you watch the Superbowl? If so, what are you serving?